Quilting books and magazines are great places to get quilting patterns as they often have a number of different patterns or designs to choose from. There are a number of magazines that come monthly, quarterly or bi-annually that offer a great selection of patterns each issue. These quilting magazines are great to keep on file and look back on when you are looking for inspiration, tips or a new pattern. Better Homes and Gardens: Complete Guide to Quilting - A one-stop quilting reference for beginners and experts. Better Homes and Gardens Complete Guide to Quilting shows readers how to master every technique, method, tool, fabric, block, seam, knot, and stitch. It’s like a private “show me” quilt class designed to help quilters expand their skills. Quilt As-You-Go Made Modern: Fresh Techniques for Busy Quilters - Do you believe rules were meant to be broken? If so, this improvisational quilt-as-you-go technique is for you. Instead of dealing with precise paper patterns and cutting measurements, you’ll learn how to piece fabric onto small, manageable batting blocks. Let your creative juices flow as you quilt directly on the blocks (not the entire quilt! ), whether in large abstract zigzags or small structured stitches. After the blocks have been joined, all you need to do is add backing fabric and binding, and—voilà—it’s finished! The Farmer’s Wife Sampler Quilt: Letters from 1920s Farm Wives and the 111 Blocks They Inspired - The 1922, The Farmer’s Wife magazine posed this question to their readers: “If you had a daughter of marriageable age, would you, in light of your own experience, have her marry a farmer?” The magazine at the time had 750,000 subscribers, and received over 7,000 letters. The best answers to this question are included in this book, along with the traditional quilt blocks they inspired. Quilting with a Modern Slant: People, Patterns, and Techniques Inspiring the Modern Quilt Community - Modern quilting allows artists the freedom to play with traditions and take liberties with fabrics, patterns, colors, stitching, and the ways in which they all connect. In Quilting with a Modern Slant, Rachel May introduces you to more than 70 modern quilters who have developed their own styles, methods, and aesthetics. Their ideas, their quilts, and their tips, tutorials, and techniques will inspire you to try something new and follow your own creativity wherever it leads. Shape by Shape Free-Motion Quilting with Angela Walters: 70+ Designs for Blocks, Backgrounds & Borders – It’s easy to plan your machine quilting—simply open Shape by Shape Free-Motion Quilting with Angela Walters and find creative inspiration on every page. User-friendly and visually exciting, the contents are first divided into three sections: Blocks, Negative Space, and Borders. Then, to make it even more accessible, the Blocks section is further organized by five shapes: Squares, Triangles, Circles, Diamonds, and Hexagons. With an illustrated index, 70 free-motion quilting designs, crystal-clear instructions, and gorgeous full-page photographs, this is the go-to resource you’ll want handy before starting any quilting project. Lovely Landscape Quilts: Using Strings and Scraps to Piece and Applique Scenic Quilts - Create beautiful landscape quilts using strips and scraps with these 15 lovely projects! In Lovely Landscape Quilts, Cathy Geier walks you through the process of creating amazing landscape quilts using simple techniques that anyone can try. Learn how to find inspiration and choose your fabrics, how to design and lay out your quilt, and how to use angles to create skies, water, hills and mountains. Sunday Morning Quilts: 16 Modern Scrap Projects – Sort, Store, and Use Every Last Bit of Your Treasured Fabrics - Are scrap piles wreaking havoc in your sewing space? Not sure what to do with all those tiny bits of gorgeous prints you hate to part with? Modern quilters Amanda Jean Nyberg and Cheryl Arkison share a passion for scraps, and they’re here to help you get creative with 16 scrappy quilt projects that include piecing, appliqué, and improvisational work. This book has ideas on how to adapt patterns for your own personal “Sunday morning” style, plus tips for effectively cutting, storing, and organizing your scraps. Your Sunday mornings just got a whole lot cozier! Machine Quilting Made Easy! (The Joy of Quilting) - At last! Machine Quilting Made Easy makes learning to machine quilt easy and fun. Get familiar with the basics as you do the exercises; then use the samples you make as handy references. Learn to machine quilt with sixteen lessons in straight-line quilting with a walking foot, freehand quilting with a darning foot, quilting with decorative threads, and more. Includes five comprehensive charts for selecting needles, thread, and batting. Find guidelines for planning quilts and basic techniques for finishing quilts. One of my Favourites - Layer Cake, Jelly Roll & Charm Quilts - Jelly Roll, Layer Cake and Charm Quilts provides seventeen beautiful projects that show readers how to get the most from their pre-cut fabric bundles. The projects range from smaller lap quilts to full-sized bed quilts and each is made from one jelly roll, layer cake or charm pack (or a combination), making the quilts quick and economical. Using the latest fabrics, the authors provide a main quilt and an alternative color way for added versatility. Simple step-by-step instructions and illustrations make creating quilts from bundles accessible to quilters of all abilities. Quilting Block & Pattern-a-Day 2015 Calendar - The Quilting Block and Pattern-A-Day calendar offers an amazing collection of new quilting designs.Providing instructions for more than 65 quilts and nearly 250 quilt block patterns, quilting artists Debby Kratovil and Jean Ann Wright deliver the materials (you provide the fabric!) for a year’s worth of stitching fun! Quilting on the Go: English Paper Piecing Projects You Can Take Anywhere - Break Free from Your Sewing Machine. Imagine being able to quilt on vacation, at the beach, or virtually anywhere else you find yourself. Jessica Alexandrakis has traveled the world with her on-to-go sewing kit and small stash of fabric, creating strikingly modern patchwork along the way. Now she shares everything she’s learned about this addictive, beginner-friendly technique. Quilting For Dummies - Get the know-how you need to create beautiful quilts and decorative quilted items. Quilting is a fun hobby -but where do you begin? From selecting fabrics and designing a quilt to stitching by hand or machine, this friendly guide shows you how to put all the pieces together -and create a wide variety of quilted keepsakes for your home. We’ll have you in stitches in no time! Discover how to select the right fabrics and threads, design your masterpiece, use quilting software, save time with rotary cutters and other cool tools, hand and machine quilt and get creative with applique. 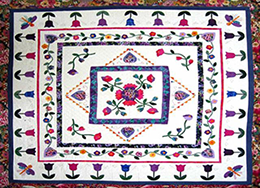 Encyclopedia Of Classic Quilt Patterns - Explore your creativity with quilting patterns using the Leisure Arts Encyclopedia Of Classic Quilt Patterns Book. Featuring new quilting techniques and ideas, this book works as an excellent reference guide for beginners and professionals to learn traditional and quick piercing, applique, rotary cutting, and other techniques. Featuring 101 projects to try along with fun patterns and variations, this quilt book is a must-have. David & Charles Books-Two From One Jelly Roll Quilts - Learn how to make two different quilts using just one jelly roll–half the fabric, twice the inspiration! Each chapter features two quilt designs made from one jelly roll, using just 20 strips of fabric for one quilt and twenty strips of fabric for the other. Eighteen patterns included to help you make your fabric go further, and the finished quilts make great throws, lap quilts, wall hangings, cot quilts and play mats. Each project features color illustrations and a color photo of the finished product.